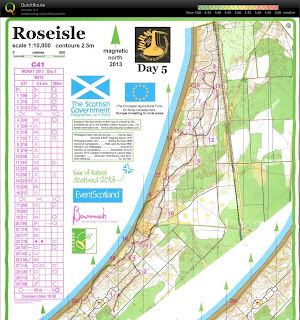 After WOC, I spent almost 3 weeks in Scotland - I visited friends in Stirling and Speyside, did some WOC 2015 relevant training, made some new friends (mostly with my fantastic lego skills) and took part in the Scottish 6 Day. 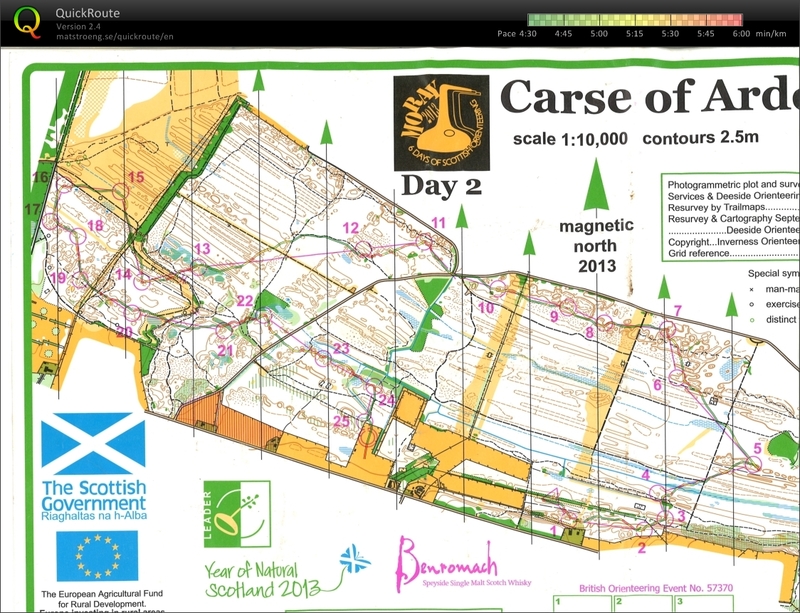 This year the 6 Day was held in Moray, with 4 coastal days and 2 inland, and it seemed like the ideal way to kick-start preparation for WOC 2015. 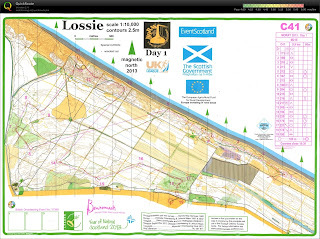 Day 1 was held at Lossie, a classic Moray sand dune area with a strip of very technical terrain along the coast, and vaguer forest inland. Unfortunately, the new motocross tracks meant that the technical challenge was really reduced for many of the controls, and some of the controls were kids course standard. But, it was still really fun, with some really challenging parts. I was happy with my performance, although an early start meant I had some long grass to contend with in places! Second place, 2 mins down on Bergman. 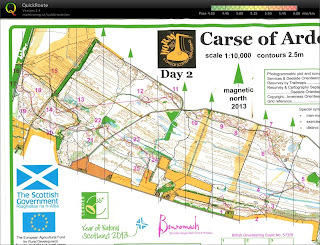 Day 2 was at Carse of Adersier, site of WOC middle test 2007. Pretty flat area, with vague contour shapes, many form line shapes even with 2.5m contour interval! Again, I did a decent race, with a couple of wobbles/bananas rather than mistakes. 3rd place, 1 min behind Rollier, and 1:30 behind Murray Strain who was just getting ready to jet off to some World Games success. Day 3 was at Culbin -probably THE classic Moray dune area, but this was Culbin West, the less well-known part, and a new area for me. Today was the first time I started to feel a bit tired, and perhaps I started a little fast, leading the course until I made a 1:30 mistake (my largest mistake of the week). I also got a bit stuck in some very high heather, and was struggling to maintain a high speed on the longer legs towards the finish. Others made mistakes too, and I was again 2nd, only 40s behind Bergman, and 15s ahead of Rollier, leaving the overall standings nicely balanced after half of the races. The following day was a rest day, so I indulged in watching the Euromeeting sprint, playing a few holes of golf (well, pitch and putt anyway - I can hit the ball fairly far, but not very straight, and usually further than I want!). Day 4 - Loch of Boath. Another new map for me, and also Euromeeting middle distance. 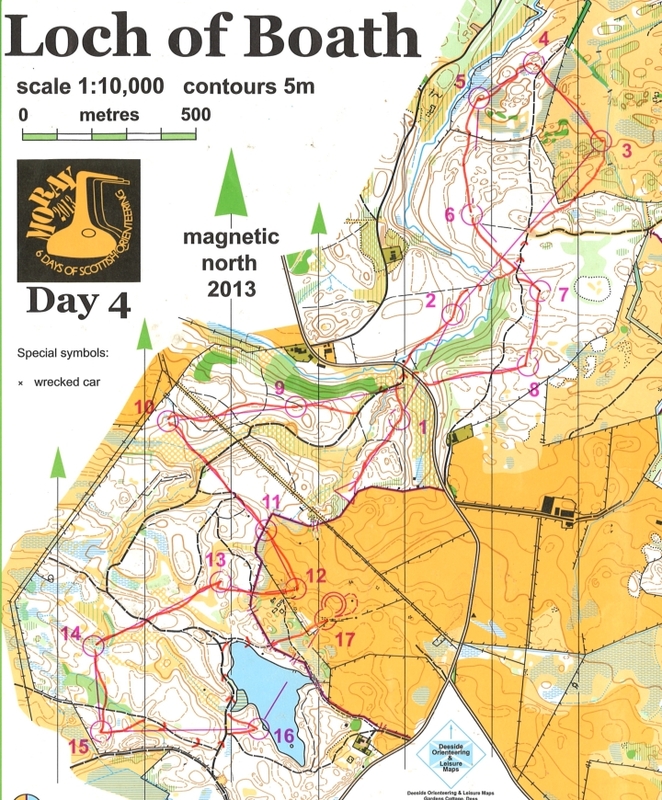 With a fairly high World Ranking, I had a quite late start, and with 140 people starting first, there were a few tracks in the forest. I had a good race technically, and felt I was running ok, although the previous 3 races meant that I wasn't quite as fresh as I could have been. I ended up 7th, just over 1 min down, and most importantly only lost about 30s to Rollier, and beat Bergman by 15s. 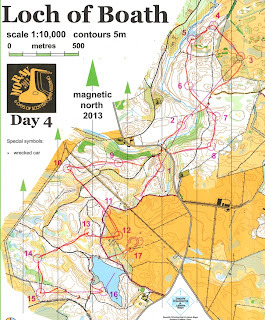 Some good results from the GB team, especially 4th place (3rd in Euromeeting) for Ralph Street! 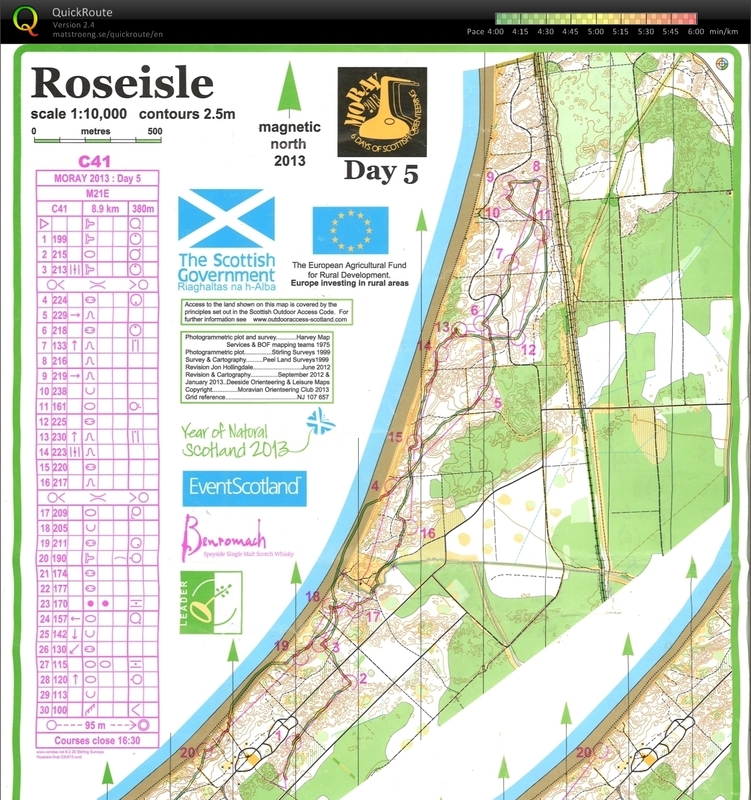 Day 5 - Roseisle. Another classic Moray coastal area, and probably the area I had been most looking forward too. It was probably the best course of the week, with a good mixture of route choice and difficult controls. 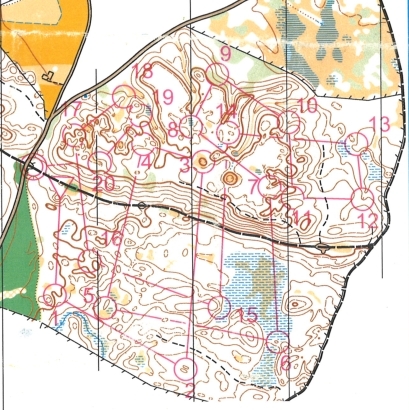 It was also the day that I felt most tired, and made the most mistakes, with 4 or 5 mistakes of about 30-40 seconds each, so I was a little disappointed with my run, and I was over 3 mins behind Rollier, and 1 min on Bergman in 3rd place. Day 6 - Coulmony and Belivat. And so, after 5 races, the situation was Rollier leading by 30s to Bergman, and then 2:15 to me in 3rd, and then a 7 min gap to Matt Speake in 4th. The last race was the one that would make or break people, and really decide the results. 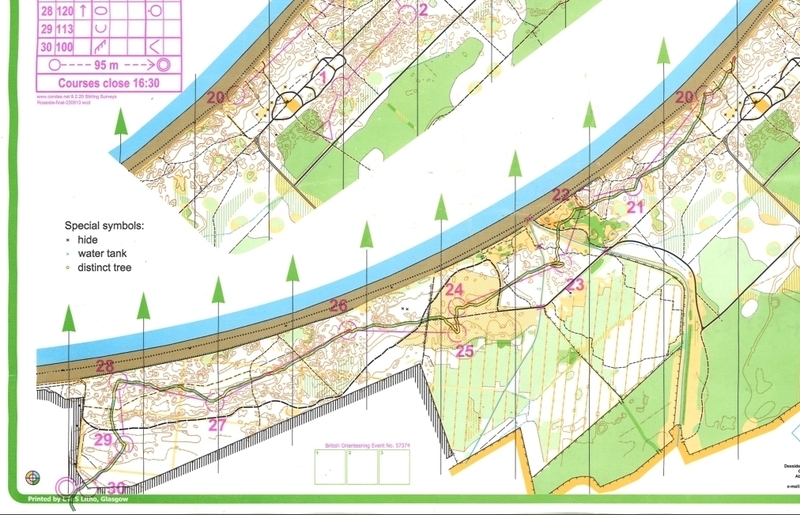 17km in tough marshy inland terrain, also doubling as Euromeeting long distance. Because of the large number of runners, there was a 1min start interval, with Euromeeting runners first, then 6 Day runners in reverse order. In practice this meant that with the quite open forest and good visibility that somebody slightly better than you started almost in sight behind, and somebody slight worse than you started almost in sight in front. Unfortunately, Bergman pulled out on the morning with some foot pain, so I had 2nd place to defend in the overall competition. I was nervous having massively hit the wall in my previous long distance race, and that was without having already run 5 races in the 6 days before! Therefore I was loaded up with gels, and paced myself from the beginning. I started well technically, and was probably quite lucky that Speakey (my minute man) made a mistake on the 4th control that was just big enough for me to get a good sight of him leaving the control, and I could then reel him in slowly over the next few controls, also catching Rich Robinson and Jegor Kostylev in the process. I finally got up to Speakey at the 9th control, but then almost immediately Rollier (who started 2 mins behind) caught us up too! I had already made a plan that if this happened I would just ignore him and run at my own speed. The group split a little, but I found a better line out of the control towards the 11th (a brutal long leg uphill through knee-deep heather covered marsh! ), and coming into the control we were all in a long line (including James Tullie joining the party). Then there was some downhill running, and whilst the group stretched out a bit, it was no problem to follow the guy in front. At this point Jegor was dropping off a bit, but we caught Chepelin instead! Everybody came back together at 14 (drinks point), and so it felt like a big group at this point! It continued like that for a few controls - people taking different lines, but all coming back together, with Matt and Oleg particularly aggressive here. Then came to a decisive point, big climbs to 19 and 20. Baptiste decided to put the boot in, and accelerated up the hill. I didn't follow, but Tullie did. Here Oleg dropped off the group also, and I was left leading a smaller group with Rich and Matt. That is pretty much how is stayed for quite a long time, with Baptiste in front with Tullie, as well as Vaher and Johnson. They slowly pulled away to finish 2 mins in front, and I just tried to maintain my own pace. The last loop was tough, and I lost some time on the route choice to the second last control, and I was very happy to finally see the finish! 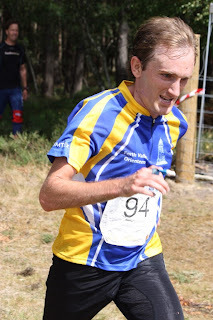 102 minutes - 8 minutes behind the best Euromeeting runners, and 4 minutes behind Rollier. Enough to secure 2nd place overall, and also to be top Brit on the day (in front of Matt who I ran for so much of the course with). A really great end to a brilliant week - tough physically and mentally.